First I want to take a moment to thank everyone for the sweet messages and prayers that my family has received this week since my Mom's heart attack. My dear friend Cathy Keisha of the pawsome Stunning Keisha blog even started a #pawcircle on Twitter for us. Words cannot express how much your thoughts have meant to me, and they appear to have worked, too! Mom is home and is feeling much better, just very tired and weak, which I'm sure is to be expected given what she's been through. It's hard to believe that yesterday's post was my 1000th blog post! Starting this blog was one of the very best things I have ever done. Writing about cats and books everyday, while at the same time becoming friends with some pretty amazing people, it's no wonder that blogging has become my passion. Needless to say, between Mom's health scare and the one year anniversary of Tara's passing, this has been an incredibly difficult week. 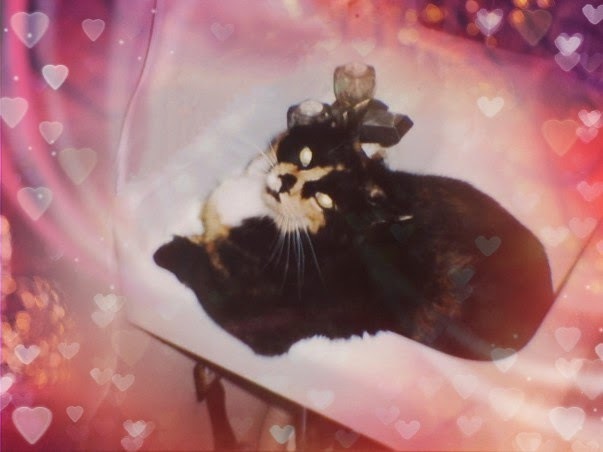 While recently going through a bunch of pictures for Tara's memorial collage, I came across the one I'm using for this week's Caturday Art post. I don't even remember taking it, and it must have been taken shortly after I adopted her, because she never spent much time laying in the sink. Her beauty in this picture just takes my breath away. I used the heart-shaped bokeh filter in Pho.to and think it came out just beautiful. We're still purring hard for your Mom. Concats on 1000 posts! And we agree, the CB is the best bunch of folks around. Oh I'n so relieved to hear your mom is home. Happy congrats on 1000! It's a huge milestone to be proud of. So happy to hear your mom is home. What a sweetie CK is... that was so nice of her to set up a #pawcircle for her. And WooHOO!!! 1000 posts!!! That's HUGE! Congratulations. Here's to 1000 more! Glad to hear your mom is home and doing better. This is a wonderful picture of Tara and I love the heart effect you used. P.S. Congrats on 1000 posts!! Luv da picture! And congrats on 1000 posts! Happy to hear your mum is feeling better. Amazing pic! So glad to hear your mom is home and doing better! Sooo happy that your Mom is home and doing better! Please give her (((hugs))) from us and concatulations on your 1000th post! We hope your Mom continues in her recovery back to good health. Concats on the 1000th posting! And what a lovely way to enhance the photo of Tara. Very beautiful. What a relief your Mom is home... we will keep her in our thoughts and prayers. And blessings to sweet Tara on her memorial... Purrs from the Zee and Zoey Gang! Sending you MANY hugs and purrs of encouragement - we can only imagine how difficult this past week must have been. And YAY for 1,000!!!! Wooo-hoo!!!! Oh Melissa, sending many good thoughts and purrs to you as you have been through so much this week...healing purrs and prayers to your Mom for her continued recovery and strength. Purrs to you as you remember your beautiful Tara, what a pretty art picture of her...congratulations on your 1000th post, such a great accomplishment! Concats on 1000! That is certainly a milestone. I haven’t come close to that number and I’ve been blogging almost 5 years. Glad your Mom is feeling better. More healing purrz are coming her way.